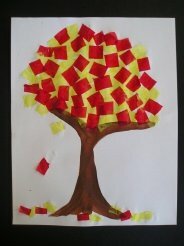 This colorful Autumn Tree is a great fall craft for preschoolers on up. You can paint on your tree trunk, or make your tree trunk with a hand diped in brown paint! 1. On your sheet of white paper paint on a brown tree trunk, or use a brown painted hand print. 2. Cut your tissue paper into squares. Make them easier to handle for younger children by cutting them bigger. 3. Water down your glue in a small container (mix about 1 teaspoon of glue with 1 tablespoon of water) and brush on your colored fall leaves onto your tree. Don't forget to make some leaves falling to the ground! If you don't have tissue paper this tree will look just as nice with colored shapes cut out of construction paper. Just glue them regularly on the paper, don't use watered-down glue (they won't stick well). It would be fun for younger children if you cut your leaves into different shapes, like orange triangles, red squares and yellow circles!